Olivia Wilde’s engagement ring from Jason Sudeikis is an amazing one, featuring a beautiful center diamond surrounded by an emerald halo. The look is fresh and contemporary, yet it’s not a passing trend. Colored stones have been starring in engagement rings since Victorian times, when the jewelry first became popular. 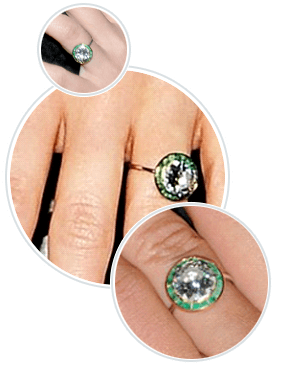 Like Olivia Wilde’s engagement ring, this knockout from Brilliance features a gorgeous round diamond at its center and a beautiful halo of emeralds that provides incredible contrast. Love the look but prefer a different gemstone? Brilliance’s collection includes halo rings made with sapphires and rubies as well as those made with all diamonds. Olivia Wilde wanted to become an actress since age two. She says that she has a strong journalistic streak, just like her parents, thinking in a critical, analytical way.In addition to her intelligence, Olivia is known for having a strong artistic side as well as an incredibly dramatic, beautiful look. She has appeared in a number of TV shows and movies including The Girl Next Door, Alpha Dog, Turistas, and Conversations with Other Women. She joined the cast of the popular Fox medical drama House in September of 2007. Olivia has won a number of awards, including the 2006 US Comedy Arts Festival Film Discovery Jury Award for Best Actress for her role in Bickford Schmeckler’s Cool Ideas. Did you know that Olivia Wilde has dual citizenship in the US and Ireland? Many of her family members are from Ireland, and she derived her stage name from that of Irish author Oscar Wilde. Olivia was previously married to Italian musician and filmmaker Tao Ruspoli. The two married in secret on a schoolbus in 2003, and divorced in 2011, citing irreconcilable differences. Wilde began dating fellow actor Jason Sudeikis in November of 2011, and the two became engaged in January of 2013. They have a son, Otis Alexander, who was born on April 20th of 2014. What Our Experts Have to Say about Olivia Wilde’s Engagement Ring. Olivia Wilde’s engagement ring is an amazing vintage find that is known to have been in Paris around 1921, according to Brides magazine. Jason chose it for her because the emeralds reminded him of her beautiful green eyes. The center stone appears to be larger than two carats, and the halo setting appears to be made of white gold or platinum. The delicate band looks stunning on Olivia’s finger, and it makes the overall setting look even more incredible. While a vintage engagement ring like Olivia Wilde’s might be hard to come by, a modern masterpiece that looks almost exactly like the one she wears is very easy to create, thanks to the online tools at Brilliance. This look has become so popular that we now carry halo engagement rings made with a variety of different gemstones, making it possible for you to give a nod to Olivia Wilde’s style while celebrating your love in a unique way that’s all your own.